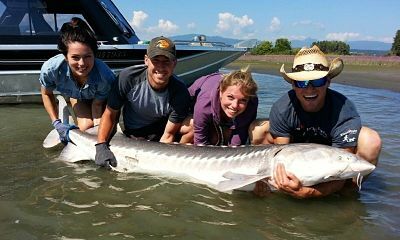 The largest city in British Columbia has a lot to offer when it comes to fishing. 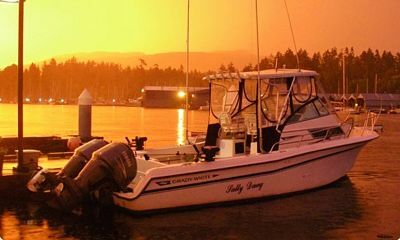 Nestled between the large inland sea of the Strait of Georgia and massive salmon streams like the Frasier River, Vancouver is a fisherman’s paradise. For couples with divergent interests, there are also a lot of urban delights to enjoy while your loved one spends days on the water. No matter whether you fish alone or together, there are a lot of places to enjoy both fresh and saltwater fishing. Preparation is always the key to a good trip. Here are a few things to consider when planning a trip to the British Columbia region. 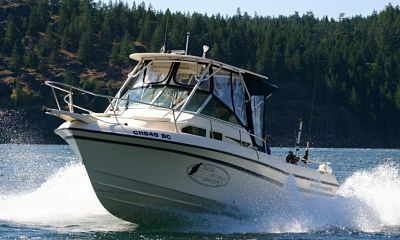 Boating Restrictions: United States boaters can enter Canadian waters for up to 45 days, provided they have a boating safety permit under their own state’s regulatory requirements. Two rules that are important to follow are (1) to avoid alcohol consumption while boating and (2) to be aware of marine mammal proximity and follow the rules for this. The world’s most famous orca population is here, along with endangered sea lion populations, humpbacks, minke whales, harbor seals, a few porpoise species, and many occasional visitors. Fines may be incurred for breaking either of these laws, with jail time for repeat offenders. Fishing Licenses: There are different freshwater and saltwater/tidal licenses available for purchase, and they can be found online or in local fishing locations. Be certain to check the local fishing regulations before you go out, as all fisheries are also subject to seasons and potential closures due to conditions like red tide. Climate: The weather in British Columbia is temperate. If you steer clear of the mountains, you will be unlikely to see snow during any month of the year, but temperatures may stay rather cool. Be certain to have many water-wicking layers, as you may need short sleeves and heavy fleece during the same day. It is also good to have strong sunscreen and some wind-deflecting layers no matter the season. Charter or Solo: There are a lot of advantages to working with a charter operation. Licenses are taken care of for you and your guide already has the knowledge of the best areas to fish without you needing to spend any time learning. Your guide has equipment for you, pieces to repair it, and the know-how of the best ways to use it. These attributes are not just appreciated by newbies and dabblers, but avid fishermen and fisherwomen who are used to a different style or species of fish. 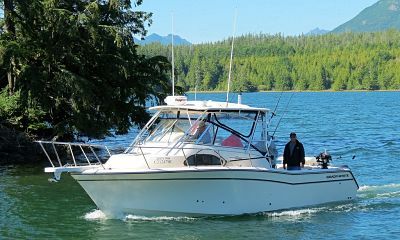 Many of the local Gulf Islands, coast of Vancouver Island, and areas just outside of Vancouver operate fishing resorts that give a good chance to fish with a guide on some days, and by yourself on others. Other Activities: If you are not planning a fishing-only vacation, be sure to consider a side trip to Banff or Victoria, a day or overnight trip boating along the Gulf Islands, a dry-suit dive in Jacques Cousteau’s second favorite locale, or a whale watching cruise. Freshwater: The rivers, lakes, and reservoirs in southern BC are well stocked with several species of salmon and trout, which are the most common freshwater favorites. Some of these are hatchery stock and others are wild. There are five species of salmon that live here, all of which have multiple common names. 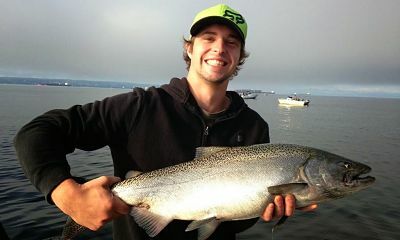 The three most popular to catch are the king/chinook, silver/coho, and red/sockeye. Additionally, there are chum/dog and pink/humpback salmon around, but the fisheries for these are less common. Landlocked versions of sockeye are called kokanee, and are a popular fish as well. Other salmon (and salmonid cousins) and trout that are common include steelhead, rainbow trout, Dolly Varden, and cutthroat trout. Many of these are caught by fly fishermen, though other methods can be used as well. Saltwater: Salmon live in both saltwater and freshwater at different stages of their life. In addition to the same salmon species in their saltwater forms, there are a number of other great saltwater fish species to catch here. Halibut is a very common choice, but there is also pacific cod, black cod/sablefish, ling cod, flounder, and snapper/rockfish to catch here. Shellfishing: Whether you like clams and oysters or crab and shrimp, there is a large amount of shellfish to be had here, provided you pay attention to tidal height and red tide warnings. Dungeness crab, spot prawns, and coonstripe prawns are great in-season, and a fun and rewarding way to pot fish. Clam diggers will find manila, littleneck, butter clams, cockles, and varnish clams in large numbers on many beaches here, along with pacific and native Olympia oysters. A short drive or boat to the coastal side of Vancouver Island also offers beaches with razor clams. Seaweed may also be gathered here for culinary use, provided you choose an area of clean water. The more adventurous can also find a small cucumber and sea urchin fishery that can be done by diving, though this may take a little research and work to get into. Capilano River: The nearby hatchery and great shore access here make this an easy way to fish by car with very little prep. It is a favorite fishing site for those who want a day of fishing without making it the focus of their vacation. Rice Lake: This small stocked lake is a great way for newbies to drop a line or teach their kids a love of fishing. Stocked rainbow trout and wheelchair accessible locations make this an easy location. Horseshoe Bay: This West Vancouver locale is the gateway to Bowen and Howe Sounds. This is a great way to get a fishing village atmosphere instead of the more urban feel of the main city. Boat rentals and charters are easy to find here. Stanley Park Seawall: For those who want to be in the middle of everything, Vancouver’s answer to central park is a perfect place to cast a line. You will not catch a huge salmon or halibut here, but it is a great place to hang out and meet lots of people while you look for a smaller catch. If you are fishing with young children, there is much for them to do while you cast a line, relax, and enjoy the beautiful sights of downtown Vancouver. Granville Island: This shopping district and home of the port of Vancouver is a great location to find boats, fishing charters, and more. If you find a day of fishing gives you nothing, the local public market offers the opportunity to fake it with a salmon or halibut filleted to order. The Strait of Georgia is the inland sea just to the west that separates mainland Canada from Vancouver Island. A large island chain can be found here, which is called the Gulf Islands in BC, and the San Juan Islands in the portion that can be found in Washington state. A large number of fishing resorts can be found here, though some are boat-in or fly-in only, as only the larger islands have ferry service. The Strait has a large number of different saltwater fishing opportunities here, one needs only to ask. Due west of Vancouver the city is the island who is also named for the British explorer who first described this region to western culture. The island is enormous, and has many different fishing opportunities, depending where you go. From the top of the island’s own mountain chain, the Interior, where different trout species can be found to the bay in Victoria, the most famous city on the island, there is a lot to discover. The island also has a sheltered side which borders the Strait of Georgia, and a Pacific side that has open ocean exposure, large swells, and opportunities for deep sea fishing. This large river just north of the U.S./Canada border is one of the most populous salmon streams in the area. It serves as home to a population of salmon large enough to satisfy sport and commercial fishermen along with a population of around 80 resident orca whales. 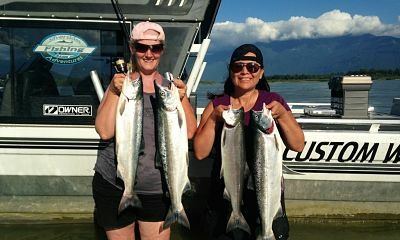 The Fraser is less than an hour south of Vancouver, and is a great way to fish both by boat and on shore. Few places in the world offer the fish diversity and bounty that can be found in the Pacific Northwest. There is truly something for everyone here, year round, along with a mild climate and friendly, hospitable residents. Whether you have come for a day of fishing or boating in between a week of soaking in urban culture, or you are ready for a more remote and in-depth fishing adventure, there are many fun choices here. The best part is that whether you catch your limit or you spend your time just breathing in the fresh air here, the atmosphere on the water is beautiful, the water is clean, and the food is exquisite. You will not be disappointed with your time in BC, and will likely be thinking about how soon to return before your trip is even over.